A Navy flight instructor says he was targeted by someone after they pointed a laser at his aircraft while he was training a student. The incident happened Tuesday evening as the plane as the plane flew over the Ocean Drive-South Staples-Alameda area. The instructor and student were just completing a "night flight operation" when they noticed a green laser pointed at them. Aviation experts say laser light can pose a serious threat to pilots. Carl Gross who is an Operations Manager over at the Corpus Christi International Airport said,"you cause temporary blindness that could potentially lead to an accident even with a vehicle on the ground. They can have a very limited effect on the eye or a cause permanent blindness." The pilot and his student were able to land safely. Both were given eye exams. The airplane was on the final approach leg of the traffic pattern to the turf runway. The private pilot recalled that the airplane was 800 ft above ground level (agl) and aligned with the runway, but he had no further recollection of the flight. A witness observed the airplane flying “low and slow” about 20 ft agl when the nose pitched upward, the airplane “stalled,” and the left wing struck the ground. The airport owner stated that the trees at the approach end of the runway were damaged, and broken branches were found scattered at the base of the trees immediately after the accident. The fuselage and wings sustained substantial damage consistent with collision with trees and terrain. The pilot stated that there were no preaccident mechanical malfunctions or failures with the airplane that would have precluded normal operation. The pilot’s failure to maintain clearance from trees during the approach. The airplane was on the final approach leg of the traffic pattern to the turf runway. The private pilot recalled that the airplane was at an altitude of 800 ft above ground level and aligned with the runway, but he had no further recollection of the flight. A witness observed the airplane flying "low and slow" about 20 feet above the ground when the nose pitched upward, the airplane "stalled," and the left wing struck the ground. The owner of the airport stated that the trees at the approach end of the runway were damaged, and broken branches were found scattered at the base of the trees immediately after the accident. The fuselage and wings sustained substantial damage consistent with collision with trees and terrain. The pilot stated there were no preaccident mechanical malfunctions or failures with the airplane during the flight that would have precluded normal operation. 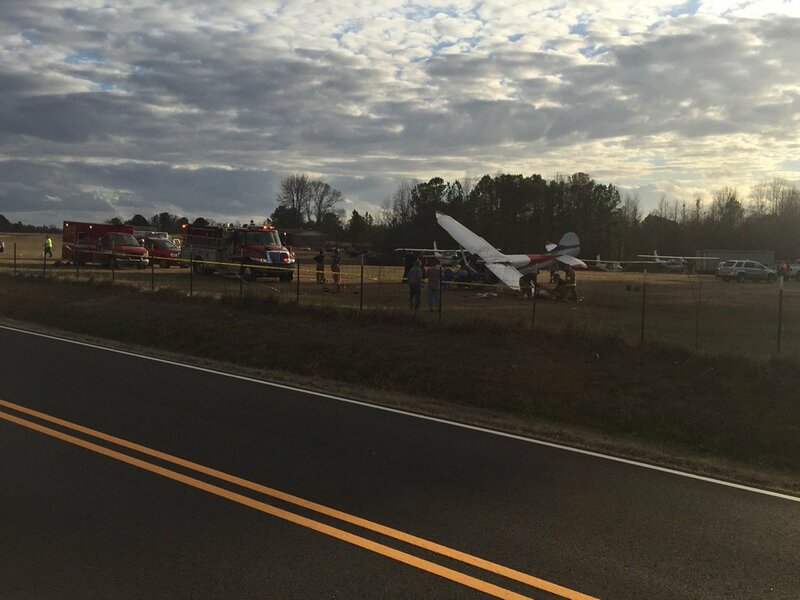 BLOUNT COUNTY, AL (WBRC) - Officials with Blount County 911 say they are responding to a crash involving a small plane. The scene at Campbell's Field, a small grass landing strip that serves small planes. Authorities say the plane was just short of the landing strip at Campbell's Field when the crash happened around 2:50 p.m. The pilot, who was the only person on board, was injured and has been transported to the hospital. Authorities have not released the pilot's condition. Eyewitness Rodney McNallay lives one house away from the field and says planes fly over all the time. He says he was sitting on his porch, watching the plane when he realized something was wrong. "When he was coming in he was way too low and he wasn't going very fast, enough to clear the trees and he tried to speed up at the last second but it didn't climb enough to get over the trees and he clipped the trees and I saw the plane was all sideways as he went over the trees and then I heard the plane hit the ground," McNallay said. First responders and witnesses tell us that the pilot is from the area and parks his plane at Campbell's Field. The Mount High Volunteer Fire Department cleaned up some fuel that had leaked. Reporter Hannah Ward is on the scene gathering more details now so check back for updates. Authorities are on the scene of a small plane crash in Blount County. Blount County 911 said they received a call about the crash at 2:53 p.m. At least three fire departments are responding to the scene, as well as an air evac helicopter, said Blount County 911 Director Caleb Branch. The crash happened at Campbell's Field on Arkadelphia Road in Hayden. Branch said Campbell's Field is a grass airstrip, and the downed aircraft is a Cessna 170A. The pilot, in his 80s, was alone in the plane, which was leaking fuel. The pilot was taken out of the plane and taken to UAB Hospital. FAA investigators are expected to be on the scene by 5 p.m.
Hayden, Ala. (WIAT) — Blount County emergency services received a call around 2:53 p.m. that notified them of a single-engine plane crash, according to Blount County 911 Director Caleb Branch. The crash happened at Campbell’s Field on Arkadelphia Road in Hayden. Emergency services were notified of one injury, the pilot, in the crash, and no others were on the plane, a Cessna 170A. Three area fire departments responded to the scene, along with an air evac helicopter, which is airlifting the pilot to the hospital. BLOUNT COUNTY, Ala. — The Blount County Sheriff's Office confirms the pilot of the small plane that crashed was injured, but is in fair condition at UAB hospital. The Blount County EMA has confirmed a small plane has crashed in Blount County at Campbell Field. 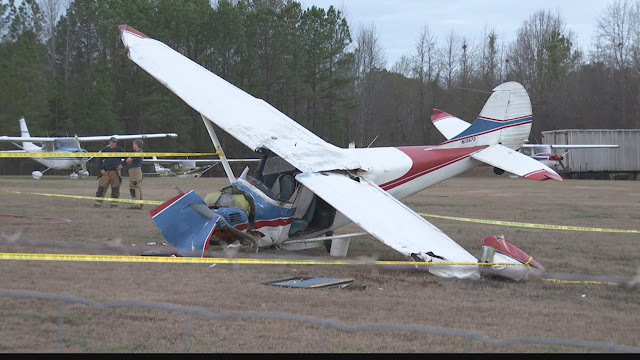 Law enforcement confirms the Cessna 170A that crashed near Campbell Field and the pilot has been extricated from the plane. Tim Kent with the Blount County Sheriff's Office says the pilot is being transported to UAB hospital at this time. 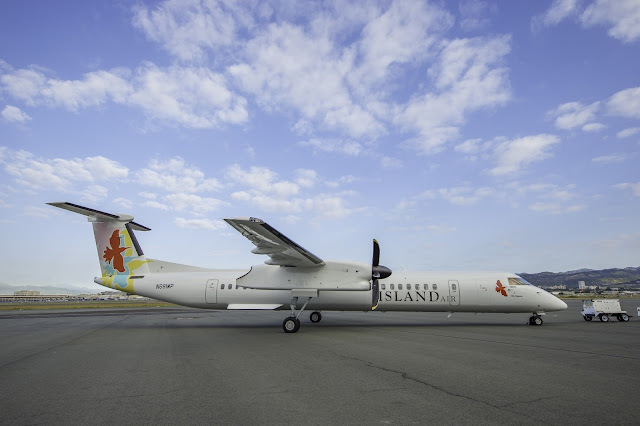 Island Air held a blessing and naming ceremony on Wednesday, Jan. 11, for the first of three new Q400 turboprop airplanes it is acquiring as part of a long-term plan to upgrade its fleet and expand the company’s presence in the interisland market. Island Air owners, managers and employees, along with elected officials, visitor industry partners and other special guests gathered at the Island Air hangar off Lagoon Drive to bless and dedicate the new aircraft prior to its inaugural interisland flight tomorrow morning. Island Air’s new fleet of aircraft will bear names that recognize seven core values developed by the airline’s team members and are integrated into the company’s mission and corporate philosophy. The names of future planes will focus on other core values including genuineness, doing the right thing, accountability, striving for the highest summit, trust and persistence. With the addition of the new aircraft, which will be put into service on Jan. 12, Island Air will increase the number of daily roundtrips between Honolulu and Kahului from six to seven, and the number of daily roundtrips between Honolulu and Kona from five to six. The new flight schedule also will see slight time changes in the six daily roundtrips between Honolulu and Līhu‘e. The new flight schedule is available on Island Air’s website. Island Air plans to convert to a full fleet of new Q400 aircraft and transition its existing fleet of five ATR-72 aircraft out of service. The Q400 turboprops are being leased through leasing company Elix Aviation Capital Limited. The agreement includes three Q400 aircraft. The second Q400 is scheduled to arrive later this week, and the third is expected to be delivered in April. The Q400 has a seating capacity of 78 passengers. The aircraft has a maximum cruise speed of 414 miles per hour and a maximum operating altitude of 27,000 feet. The Q400 is 30% faster than conventional turboprops and features a new, advanced noise reduction and vibration suppression system to allow passengers to enjoy a quieter, smoother cabin experience. The new aircraft also burns 30% less fuel and produces 30% lower emissions on short-haul routes, making it more environmentally friendly compared to other aircraft currently serving the Hawaii market. In addition, its noise footprint is two-and-a-half times smaller, which will be less disruptive to the community as it flies overhead. The first attempt to get $20 million to expand the U.S. Customs capacity at Stewart International Airport did not get far with the people who need to approve it, the Port Authority board of commissioners. Perhaps there is still hope that at some future meeting the board might reconsider and spend what amounts to a rounding error in their budget but looms large in the Hudson Valley. After all, this is not just wishful thinking. It is based on a real possibility, the news announced toward the end of the year that Norwegian Air had received the necessary federal permission to fly its new planes to the United States. And Norwegian, hoping to compete with low fares, knows that it will save money if it avoids expensive metropolitan area airports. It already services those and has announced that it hopes to fly its new planes to Stewart, hoping to capture a part of the metropolitan New York market, and Providence, R.I., hoping to lure passengers who otherwise might fly out of Boston. Since that initial announcement there has not been much coming from the people at Norwegian. They have made news in Europe with talk about filling in on some international routes that some other carriers have abandoned. Virtually all of the news concerning Norwegian Air includes Stewart as a likely, though not 100-percent-sure, destination. Those who believe that Stewart has a better future need to be realistic. We have seen in the past how unrealistic expectations have led to disappointment and, in a more expensive fashion, unnecessary expansion. Not that long ago those who run the airport doubled the size of the main parking lot and added an overflow lot down the road. So far, no vehicles have overflown and the main lot is rarely more than half full. There has been a lot of investment in the runways, money that has been well spent. But it is unrealistic right now to talk about expanding a terminal and offering more amenities when there is never anything approaching a crowd these days, given the few flights that come and go. The Port Authority and the airlines continue to treat Stewart as excess inventory, a place that is nice to keep up but not necessary for daily operations. None of the major airlines that keep a minimal presence here have even hinted at expansion and when things go wrong in the three metro airports, when runways need to be repaired or storms hamper operations, they never divert planes to Stewart. Besides, the Port Authority faces a contentious and divisive multi-billion-dollar challenge with the impending replacement of the aging bus terminal on top of the usual disagreements over capital and operating budgets. Customs officials have said they can handle international flights should they arrive on the schedule Norwegian has planned. For now, those who offer official advice on Stewart should abandon their usual "if we build it they will come" mentality and trade it for a much more realistic one - "Let them come and then we'll start building." Norwegian has proposed a modest start and Stewart should respond modestly as well. WESTFIELD, Mass. (WWLP) – Westfield-Barnes Regional Airport is trying to find the best solutions to help its neighbors impacted by the roar of jets taking off. Wednesday night, more than 30 residents were looking for information about a federal noise mitigation program, dating back to 2009. The City of Westfield hired Wyle Acoustical Engineering to create a noise exposure map; 217 homes are affected by airport noise. Westfield receives $2.5-million from the FAA every year, starting last year. Part of that money will pay for sound insulation, and outright buying of impacted homes. So far, 10 homes have been purchased, and 25 more homes are eligible for purchase. Westfield City Councilor Bill Onyski told 22News breaking up neighborhoods is not the best thing for anybody and it takes tax dollars away from the City of Westfield. Federal prosecutors have charged a Tulsa man on allegations he held a knife to a child’s stomach during a Tulsa-bound flight Friday, forcing the plane to divert to Las Vegas. A federal prosecutor in Nevada charged Fredrick James Johnson, 39, on Monday with simple assault, according to court documents unsealed Tuesday and confirmed by a U.S. District Court spokeswoman. Johnson pulled a knife on a juvenile, who was only identified as being younger than 16, while on an Allegiant Airlines flight from Los Angeles to Tulsa, according to the court documents. The juvenile told authorities that Johnson “was acting confused and strange during the boarding process,” FBI Special Agent Nicholas Bugni states in an affidavit. Johnson reportedly was en route to Omaha, Nebraska. The juvenile and his adult sister told investigators that Johnson began dismantling a tablet computer and attempted to rewire it, according to the affidavit. Johnson then allegedly brandished a knife at the juvenile, attempting to make him hold the device. The juvenile’s sister intervened, but Johnson began waving the knife around, “pointing it directly at (the child’s) abdomen,” the affidavit states. A flight attendant reportedly was able to confiscate the knife and move Johnson to a different seat. Chris Jones, a spokesman for McCarran International Airport in Las Vegas, said the plane diverted to that city and landed. “And upon its arrival here one passenger was removed from the aircraft and taken into custody by law enforcement agents,” Jones said in an email to the Tulsa World. The flight resumed about three hours later, arriving in Tulsa around 9 p.m.
Annina Collier, a Tulsa resident on the flight, told Tulsa World that federal agents entered the plane with rifles to take Johnson into custody. “I had my 1-year-old daughter in my lap, and I was crouched over her in case bullets started flying,” Collier said. In Las Vegas, Collier said, the plane and its passengers’ belongings were searched before the flight took off for Tulsa. The alleged knife incident happened the same day a gunman fatally shot five people and wounded six others at Fort Lauderdale–Hollywood International Airport in Florida. Officials at Los Angeles International Airport announced the same day that they had deployed additional law enforcement resources and increased the security presence in the central terminal area, the LA Times reported. Aircraft force landed on a dirt road. Aircraft on landing went off the runway into the grass. The pilot of the tailwheel-equipped airplane reported that, while en route, the engine had “slight roughness,” so he decided to land in an open snow-covered field on top of a hill to troubleshoot the issue. The pilot further reported that he resolved the engine issue on the ground and decided to take off downhill with a tailwind. During the takeoff roll, the pilot reported that he “noticed [wind] gust on the tail,” the main landing gear were “sucked down” in a 1-ft-deep snow drift, and the airplane nosed over. The left wing, fuselage, and vertical stabilizer sustained substantial damage. The pilot's decision to take off from unsuitable terrain with a tailwind, which resulted in a nose-over. The pilot of a tailwheel-equipped airplane reported that while en route the engine had "slight roughness," so he decided to land in an open snow covered field on top of a hill to troubleshoot the issue. The pilot further reported that he was able to resolve the engine issue on the ground and decided to takeoff downhill with a tailwind. During the takeoff roll, the pilot reported that he "noticed [wind] gust on the tail," the main landing gear were "sucked down" in a one-foot snow drift, and the airplane nosed over. The pilot did not report any preaccident mechanical malfunctions or failures with the airplane that would have precluded normal operation. The private pilot reported that, during a cross-country flight, the airplane encountered ice that began to accumulate on the wing and landing gear. He then attempted to divert to another airport. Subsequently, ice accumulated rapidly on the windshield and obscured the pilot's vision. The pilot maneuvered the airplane near the diversion airport for about 45 minutes; however, the weather deteriorated, so the pilot diverted to another airport. The pilot stated that, while attempting to land while looking out the side window, the airplane stalled about 30 ft above the ground, which resulted in a hard landing. A review of weather information for the area where the reported icing encounter occurred revealed no probability of icing at the reported time and altitude of the encounter and only about a 10% chance of trace icing during the hour following the encounter. Based on the available information, the airplane likely encountered unforecast icing during the flight, which resulted in structural icing that obscured the pilot's vision and increased the airplane's stall speed. When the pilot attempted to land, the airplane stalled at a higher-than-expected speed, which resulted in a hard landing. The airplane's encounter with unforecast icing conditions, which led to structural icing that obscured the pilot's vision, an aerodynamic stall, and a subsequent hard landing. On January 11, 2017, about 0913 central standard time (all times cst), a Cessna 182T bearing Canadian registration C-GTBI, was substantially damaged during landing on runway 18 at the Green Bay-Austin Straubel International Airport (GRB), Green Bay, Wisconsin, following an in-flight structural icing encounter. The pilot, who was the sole occupant, was not injured. The airplane incurred structural damage to the forward fuselage and firewall. The aircraft was registered to Falconair Ltd., and operated by the pilot under the provisions of 14 Code of Federal Regulations Part 91 as a business flight. Visual meteorological conditions prevailed for the flight, which was not on a flight plan. The flight originated from Sawyer International Airport (SAW), Marquette, Michigan about 0505, with Falls International Airport-Einarson Field (INL), International Falls, Minnesota as the intended destination. About 30 minutes into the flight, controllers advised the pilot that moderate icing was reported over Houghton County Memorial Airport (CMX), near Hancock, Michigan. The pilot advised controllers that he would alter his course more to the southwest. About one hour into the flight he noticed ice accumulation on the wing and landing gear and advised controllers that he wanted to divert the flight. He stated that heavier ice accumulation came on quickly and obscured his vision through the windshield. The pilot diverted to Lakeland Airport/Noble F. Lee Memorial Field (ARV), near Woodruff, Wisconsin. He circled ARV in preparation for landing, but the weather conditions at ARV deteriorated to instrument meteorological conditions. He then advised controllers that he was proceeding south to reach visual meteorological conditions. He opted to land at GRB and received approach guidance from GRB approach controllers. He stated that when 30 ft above the runway, he applied flaps for landing, the airplane stalled, and a hard landing occurred. Radar track data for the final portion of the accident flight showed the airplane made a left turn near Manitowish Waters, Wisconsin, and proceeded on a south-southeast heading toward ARV at an altitude about 2,700 ft. above mean sea level (msl). The airplane maneuvered near ARV, at altitudes varying from 3,000 ft. msl to 1,900 ft. msl, for about 45 minutes before proceeding south. The airplane ultimately turned east toward GRB before making an approach to runway 18 at GRB. Current Icing Potential (CIP) product information for the area where the pilot reported the icing encounter showed no icing at 3,000 ft. msl. The one-hour Forecast Icing Potential (FIP) icing forecast, valid at 0700 and applicable to 3,000 ft. msl, showed the icing severity as trace ice, an icing probability of about 10%, with the supercooled liquid drop potential as unknown. For the same location and time, but at a higher altitude of 5,000 ft. msl, the CIP icing severity was light to moderate, the icing probability was 40-50%, with the supercooled liquid drop threat was unknown. The one-hour FIP icing forecast, valid at 0700 and applicable to 5,000 ft. msl, showed the icing severity as light, an icing probability of about 30%, with the supercooled liquid drop potential as unknown. An Area Forecast that included the state of Wisconsin, Lake Superior and the Upper Peninsula of Michigan was issued at 0445. With regard to the approximate location of the accident aircraft's initial icing encounter: the portion of the Area Forecast directed toward the northwestern portion of Wisconsin forecasted overcast clouds at 3,000 ft msl with cloud tops to 25,000 ft., visibility of three statute miles, light snow; the portion of the Area Forecast directed toward the northeastern portion of Wisconsin forecasted overcast clouds at 6,000 ft. msl with cloud tops to 27,000 ft., broken clouds at 2,500 ft. msl beginning at 0700; the portion of the Area Forecast directed toward the western portion of Lake Superior and Upper Peninsula of Michigan forecasted overcast clouds at 2,000 ft. msl with cloud tops to 25,000 ft., visibility of three statute miles, scattered light snow showers. 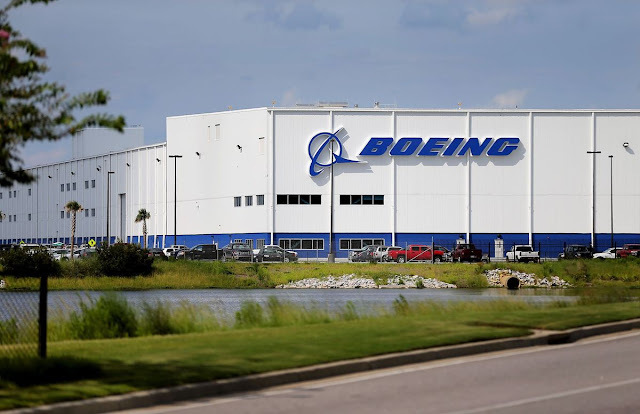 Boeing Co. plans to offer voluntary layoffs to engineers company-wide this month, including workers at its North Charleston facilities, as the aerospace giant begins to enact cost-cutting measures first outlined to employees before the holidays. The company will offer the voluntary layoffs to its engineers at South Carolina, Washington state and California locations. It has not said how many jobs it plans to trim. "We don't share specific targets," Boeing South Carolina spokeswoman Lori Gunter said. Boeing spokesman Doug Alder said the company also "will aggressively reduce overall spending in 2017 in non-labor areas so we can meet our current commitments and invest in our future." The company also will continue to focus on matching employment levels to business and market requirements, Alder said. "Employment reductions will come through a combination of attrition, leaving open positions unfilled where appropriate, and offering a VLO program," he said, referring to voluntary layoffs. "Where needed and in some circumstances, we may also need to use involuntary layoffs." This is the second time in less than a year that Boeing has asked engineers at its North Charleston businesses to take voluntary severance. In April, the company offered voluntary layoffs to 200 engineers at the 787 Dreamliner assembly campus at Charleston International Airport and at Propulsion South Carolina, which makes engine parts for the 737-MAX in Palmetto Commerce Park. The company has not said how many accepted the buyout offer. Boeing - one of the Charleston region's largest employers - has trimmed more than 650 jobs over the past year, reporting a workforce of 7,609 full-time workers and contractors as of Dec. 22. Company-wide, roughly 9,000 jobs have been cut in recent months, leaving a workforce of 150,540 people. The news comes weeks after Kevin McAllister, the new CEO of Boeing Commercial Airplanes, and retiring division CEO Ray Conner said in a memo to employees that slowing sales and increased competition with Airbus will force further cost-cutting in the new year. Alder said similar announcements will be coming for other work groups as plans are finalized. “We’ll be notifying employees as different areas and functions ... finalize their plans,” he said. Boeing delivered a record 137 Dreamliners in 2016, but sales of the wide-body plane have slowed in recent years and the company has been in a price war with Airbus as both companies compete for orders. Boeing has a backlog of about 700 Dreamliners. While you're planning for spring and summer 2017, Spirit Airlines wants to give Houstonians some ideas. The low-cost airline announced on Tuesday that it's adding two new routes from Houston's big airport, otherwise known as George Bush Intercontinental Airport, or IAH. Nonstop, daily year-round service from Bush to Newark Liberty International Airport, and a seasonal route to Seattle-Tacoma International Airport, both begin on April 27. The latest additions are part of 10 new routes announced this week, Spirit says in a statement. "These new nonstop flights, combined with our ultra-low fares, will give many more customers the chance to check off their travel bucket lists with more money saved to spend making memories on vacation," Mark Kopczak, Spirit Airlines' vice president of Network Planning, said in a statement. 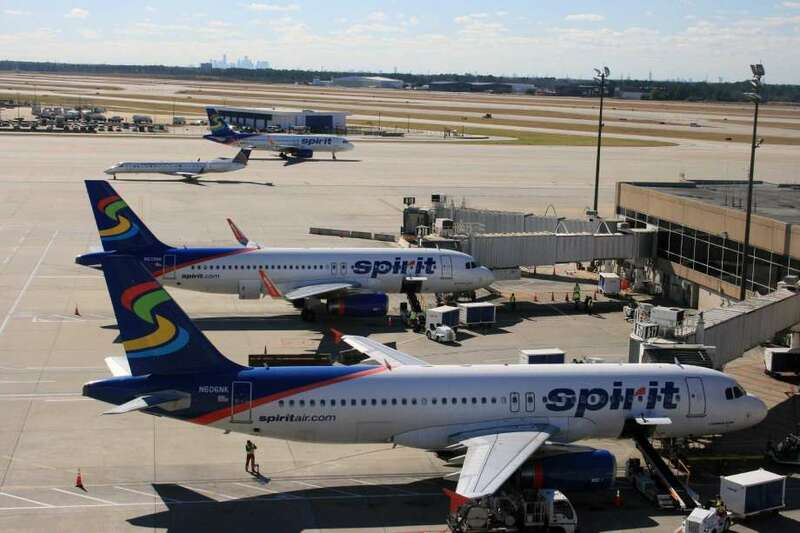 Spirit, based in South Florida, has been known for its cheap flights and no-frills passenger experience. Opponents of privatizing the government’s air traffic control operations are urging the incoming Trump administration to reject any overhaul efforts in the new Congress. The effort comes hours before a Senate confirmation hearing on Elaine Chao, President-elect Donald Trump's nominee to lead the Transportation Department. The hearing will provide senators the opportunity to press Chao on her positions on a wide range of transportation and aviation issues. “Privatizing Air Traffic Control is a solution in search of a problem at a time when we need to strengthen middle class workers and rural communities instead of leaving hardworking Americans vulnerable to corporate interests,” said Julia Alschuler, a spokesperson for Americans Against Air Traffic Privatization. The coalition includes Daily Kos, In the Public Interest, RootsAction.org and People Demanding Action. The founder of Daily Kos, Markos Moulitsas, is a columnist for The Hill. Although Trump has not specifically spoken out about air traffic control, he has long talked about the need to modernize the country’s “third-world airports,” raising hopes by proponents of privatization that he may have a sympathetic ear on the issue. Rep. Bill Shuster (R-Pa.), chairman of the Transportation and Infrastructure Committee, said he is once again preparing to introduce a proposal to transfer ATC operations from the Federal Aviation Administration (FAA) to a not-for-profit corporation. Shuster plans to tuck the proposal into an upcoming FAA reauthorization bill, which could set the stage for a potential showdown in Congress as some Republicans have opposed the plan. Supporters argue that ATC reform would modernize the U.S. aviation system and bring it in line with countries like Canada that have set up similar outside agencies for air traffic control. The government would still maintain oversight, but the entity would not be subject to the unpredictable appropriations process. But critics have painted Shuster’s effort as an example of corporate welfare, since the nonprofit entity wouldn’t have to pay for a system that has cost the government tens of billions of dollars. They also say there is no evidence that the overhaul would improve safety or cut down costs. Shuster was able to muscle his proposal through committee last year — the farthest it has ever gone — but was unable to get a House floor vote amid opposition from his own party. GOP appropriators don’t like that the plan removes ATC from the congressional appropriations process, while Republican tax-writers are concerned it hands over the power to impose fees for the use of air traffic services to a nongovernmental agency. “A Republican-led Congress has rejected ATC privatization time and time again on the grounds of safety, feasibility, and overall concern for the American people,” Alschuler said. 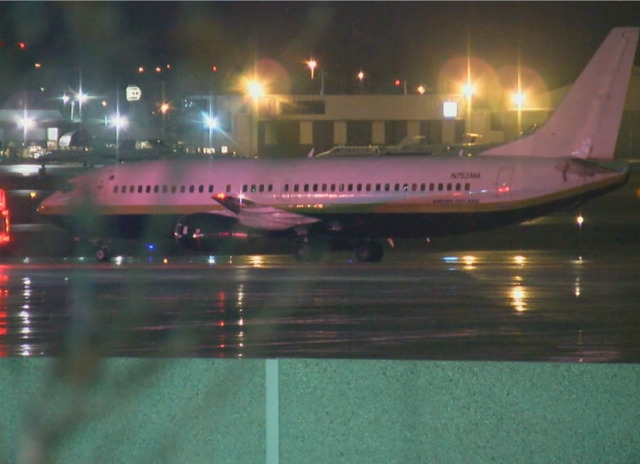 MILWAUKEE - Members of the Miami Heat NBA team escaped injury after their charter plane slid on the runway at Milwaukee's General Mitchell International Airport Wednesday night. 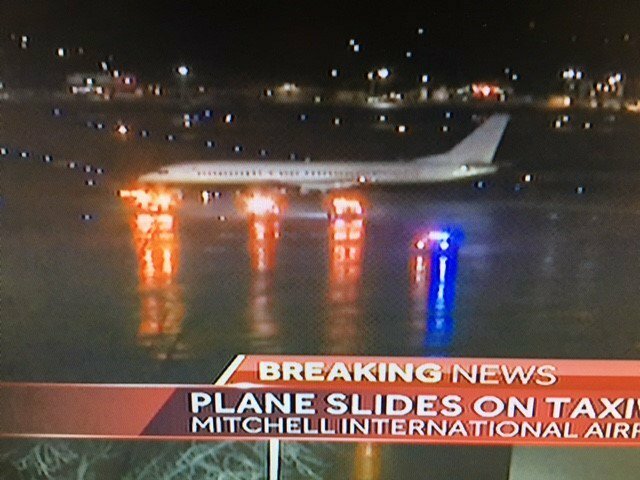 MILWAUKEE, WI - The Miami Heat's charter plane slid on an icy runway at General Mitchell International Airport upon landing Wednesday night, a team spokesman said. The slid happened while the plane was taxiing, the Miami Heat tweeted. The plane never left the pavement. 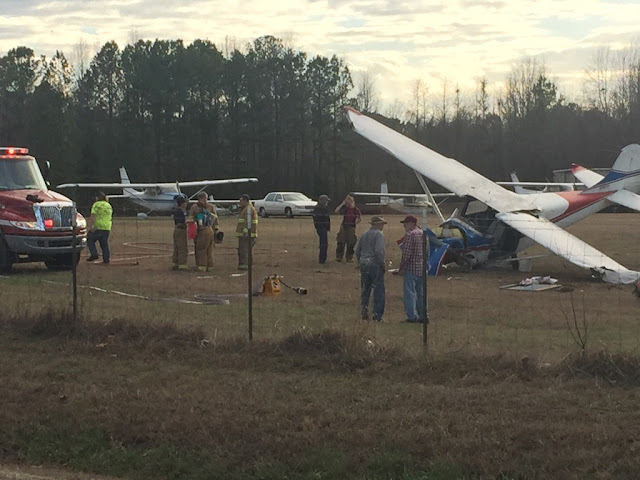 A source tells Local 10 News that the plane had to be towed back to safety. The source also described the incident as "annoying," and added that everyone onboard is OK. The Heat are in Milwaukee to close out a six game road trip that ends on Friday. A charter aircraft carrying the Miami Heat slid while taxiing after it landed at Milwaukee's General Mitchell International Airport Wednesday night, the NBA team has confirmed. "Upon landing in Milwaukee tonight the team plane slid while taxiing but never left the pavement," the team tweeted. "Everyone on board has deplaned and is ok."
ABC's Milwaukee affiliate, WISN, reported that the incident occurred around 9:20 p.m. The incident was caused by snow on the runway, reported ABC Miami affiliate WPLG. WPLG also reported that Miami Air Boeing 737 was towed back to safety after it slid too far on the runway. The Heat are in Milwaukee to close out a six-game road trip that ends on Friday. The team will play the Milwaukee Bucks on Friday.